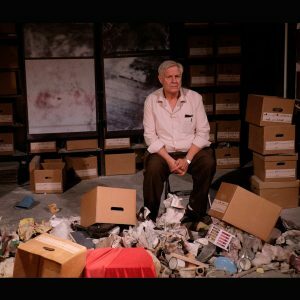 The play is set in the office of a Palestinian real estate appraiser dealing with homes destroyed by the Israeli armed forces. On his desk are boxes that he empties one by one. We watch as he goes from house to house, writing reports on the damage. These at times humorous scenes are all based on actual incidents. Not surprisingly, the play caused considerable controversy when it was first staged at Acco Festival of Alternative Israeli Theatre, with the culture minister ordering the script be vetted before the premiere. As the play unfolds, the office fills with rubble. For the appraiser, who originally wanted to be an archaeologist, this destruction is symptomatic of both the history and present reality of the Palestinians. Born in Haifa in 1973, Einat Weizman studied acting in American and the UK before majoring in film and politics at Tel Aviv University. While starring in lead roles in film, television and theatre, she has also carved out a reputation as a columnist about politics and social issues. As a director and playwright, her recent work has radically criticized the Israeli policy of occupation. Her major work includes “Shame” (2015) and “The 112 House: A Lesson in Political Construction” (2017). Born in 1945, George Ibrahim built a career as an actor before studying theatre at Hebrew University of Jerusalem, and going on to work as a playwright and director. 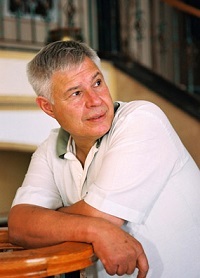 His major work includes “Ramzi Abu Al-Majd,” which won the Best Actor Award at the Carthage International Theatre Festival 1995, and “Immigrant,” which won prizes for directing and costume design at the Carthage International Theatre Festival in 1999. He won Best Performer at Acco Festival of Alternative Israeli Theatre for “Palestine, Year Zero.” He previously visited Japan with “Alive From Palestine (Stories Under Occupation)” (2004, 2011) and “The Wall‚ÄîStories Under Occupation II” (2005) as well as “Rashomon | Yabunonaka” at F/T14 in collaboration with director Yukari Sakata. Held in the theatre lobby. Open to audiences with tickets to performances that day. Born in 1953 in Saga Prefecture, Toshikuni Doi first became involved with the Palestinian-Israeli problem in 1985. He has been filming in Palestine and Israel for 17 years, and, working with the Palestinian Documentary Society, completed the four-part “Unheard Voices: Palestinians, Israelis, and the Occupation” in 2009. His recent work includes “Life in Gaza” and “Attack on Gaza: Summer 2014” (both 2015). Born in Tokyo in 1960, Mari Oka is a specialist in modern Arabic literature. Following her encounter with the plight of the Palestinians through the work of Ghassan Kanafani while a student, she has continued to be involved with projects and research related to the Palestinians. She is the author on many books about Arabic literature and also the leader of Readers Without Borders, which presents public readings of plays. She recently wrote and directed “The Message from Gaza” as part of her pursuit of the power of literature and the natural voice. In 2014, Festival/Tokyo worked with Al-Kasaba Theatre's George Ibrahim, who performs Einat Weizman's “Palestine, Year Zero.” Teaming up with the director Yukari Sakata, the dramaturge Kaku Nagashima and visual art unit Mé, “Rashomon | Yabunonaka” was a unique theatrical event inspired by Kurosawa's film “Rashomon” and Akutagawa's original short stories with a Middle East twist. This is a screening of video footage of the performance at F/T14.